It is not just a big non-league game coming to McKenzie Stadium on Friday when Union hosts Puyallup. It is a big non-league game that actually means something now. In the past, all non-league games in Washington high school football were for bragging rights and a better record. That’s it. Winning or losing a non-league game had absolutely zero impact on a team’s playoff bracket. Before this year, it was all about how a team performed in league and/or district, and then, for most teams in the state, winning the Week 10 state preliminary round playoff game. From Week 10, the brackets were formed. The avenue to reach state has not changed. League games and, for most of the state, winning in Week 10. Union and Puyallup will come into the game ranked in the top five by The Associated Press. The Seattle Times has the Titans at No. 2 and the Vikings at No. 3. But let’s say, for the sake of argument, that the winner of this game runs the table and gets to state at 10-0. That would be a lock for a top-four seeding. Let’s say the loser wins the rest of its games and finishes 9-1. Still would likely be a good seed, but could lose out on a top-four. In the grand scheme of things, a team will still have to win four state playoff games to win a state championship. But in theory, a top-four seed will have a better path than say a 6, 7, or 8 seed. This is just an added benefit of having a seeding committee. Now, all those great non-league games — such as Bellevue and Camas last week — mean a little bit more. But again, not too much more. Seedings will be made, but the teams with the worse seeds are still planning to show up. That would be the day of state championship game for Class 4A. As far as Friday’s game, Rosenbach is just thrilled to host such a quality opponent. Ryland Spencer, an analyst for Cascadia Preps, is expected to be at the game, too. He covers high school football and recruiting in the Northwest. He is not sure what he is about to see, other than he believes it will be a close game. As far as the lead-up to the Puyallup game, Union went on the road and took down Chiawana last week, 41-9. Alishawuan Taylor had four sacks for the Union defense. “He did a really good job of being who we need him to be, that physical pass rusher,” Rosenbach said. In fact, the Union defense was solid all night, the coach said. It was the offense that took a half to get going, and then it really got going for the Titans. “They kind of wait for someone to be the spark, then they light a fire and they go,” Rosenbach said. In Week 4, that spark was Jojo Siofele. Still limited on offense due to an ankle injury, Rosenbach decided to throw him in for a series early in the second half. Even in defeat, it was fun for the Camas Papermakers. Just another reason to love high school football. The Papermakers did not like how the game ended Friday night when Bellevue rallied to beat them 38-35. But two of the stars of that game told me just a few minutes later that playing in a game like this is what they dreamed about when they were younger. Naturally, the Papermakers wanted to win such a game. Doc Harris Stadium, one of the greatest atmospheres for big schools in the Northwest. Bellevue in town, one of the premier programs in the state with 10 official state championship. The completely different strategies with Bellevue running the ball all but play and Camas getting most of its yards through the air. And then, that improbable fourth quarter. Camas got the ball, up 28-14, with 6:29 left in the game. The Papermakers went three-and-out, and then the punt was blocked, setting up Bellevue at the Camas 15-yard line. Bellevue recovered an onside kick. At 4:34, Bellevue was in the end zone again to tie the game. Seconds later, on Camas’ second play from scrimmage, a tipped ball at the line of scrimmage fell into the hands of Bellevue defensive lineman for an interception. At 2:40, Bellevue scored again, this time to take a 35-28 lead. For many teams, it would have been over. That kind of shock would have been too much to overcome. Instead, the Papermakers responded with an Andrew Boyle to Jackson Clemmer long touchdown pass to tie the game at 2:17. The Camas defense came up big, too, forcing Bellevue to punt. Camas tried one deep pass to avoid overtime, but that was intercepted. Still, there were less than 30 seconds left at this point, and Bellevue was on its 30-yard line and Bellevue does not pass. So it appeared this game would be going to overtime. 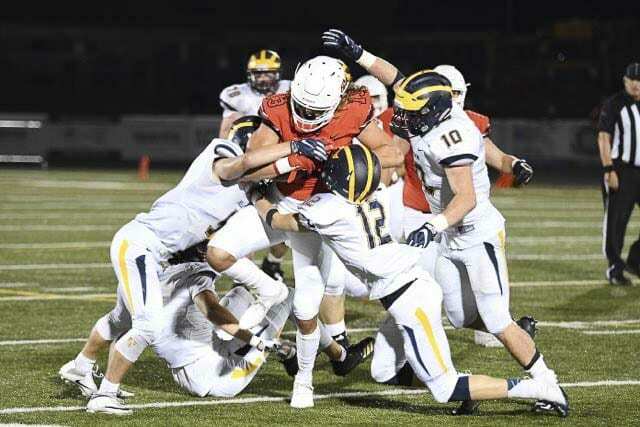 Bellevue ran four plays — three running plays for a total of 54 yards, and a spike to kill the clock — and connected on a 41-yard field goal on the final play of the game for the win. And after all that, the Papermakers appreciated all that just went down, even though they lost. That was class. Plus, there was a lesson for the Papermakers. The Skyview Storm will hit the road again in Week 5 but only for a short trip to Battle Ground. Still, it’s a good sign for the Storm. They are now 2-0 on the road after escaping Saturday night against Rogers. “I never thought you could turn the ball over six times and win, but we did,” Skyview coach Steve Kizer said. Yes, six times. Including three on special teams. “We really gutted it out on defense a couple of times. We were on the field the whole second half,” he said. Defense topped Rogers. Rogers punted. Skyview turned it over. Repeat. “We have up 10 (points in the second half) but we easily could have given up 40,” Kizer said. In one possession, Rogers was in the red zone for what seemed like 15 plays, the coach said, due to Skyview penalties giving Rogers more and more chances. No matter. The defense still kept Rogers out of the end zone. On offense, Gabriel Martin scored on a long touchdown run for the Storm. Why is that significant? Kizer believes it is the first time a freshman has ever scored for any of his Skyview teams. This is Kizer’s 15th season with the program. This was not a stunning result for the Battle Ground Tigers. Yes, they knew they had lost three in a row to open the season and they were not close in any of those games. But they also knew who they played. They knew they were getting better. And they knew they would be ready for a rival. The Tigers rushed for close to 400 yards in picking up their first win of the season. Daniel Thompson had 218 yards and two touchdowns. Trent Thompson was close to 100 and scored two touchdowns, too. “We just finally came to mind with the kids and the kids came to mind with us. It was time to settle down, work hard at practice, and do the right things we’re supposed to be doing,” Kesler said. Kesler credited Blake Harris, Steven Hancock, and Daniel Thompson for their pass rush. He praised Boden Strouse, Seth Workman, Jordan King-Gonzalez and Garrett Moon for their pass coverage. The coach was thrilled with the defense for most of the night. For a year, Battle Ground gets bragging rights in this rivalry game. District Stadium is on the campus of Battle Ground, but it was a home game for Prairie. So the Tigers were on the “other” side of the field. The score was a combination of things for the Timberwolves. They went up against a very good team, and they were short-handed. Heritage was down five regulars, due to injuries. Instead, he hopes it is a learning experience for his squad. “What it taught everybody, we just can’t have everybody but one person or everybody but two people on the same page. We have to have everyone on the same page,” Gracey said. “We’d have a beautiful play started, one person makes a mistake, and it blows up in your face. The future starts this week for Heritage, opening up league play. The Timberwolves take on Camas. 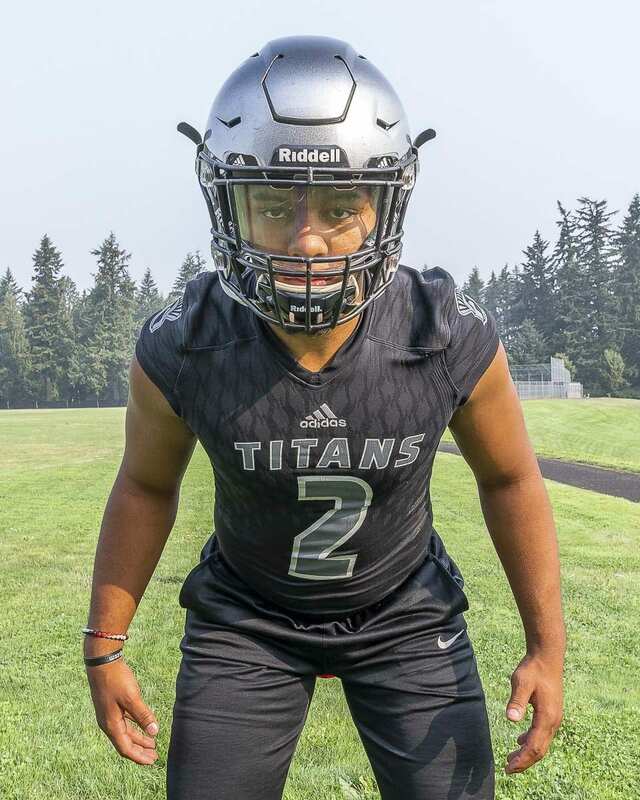 The Class 4A Greater St. Helens League has been strong for years.